Each of the 366 meditations in this gathering of wisdom is designed to move readers away from turmoil, strife, and divisiveness and lead them toward peace, resolution, and cooperation. This shift in consciousness is challenging, but with the words and ideas of this book, readers can assemble a collection of practical tools for peaceful living. The learned behaviors of cynicism, resentment, and getting even are replaced with the skills of Nonviolent Communication, including recognizing one's needs and values and making choices in alignment with them. 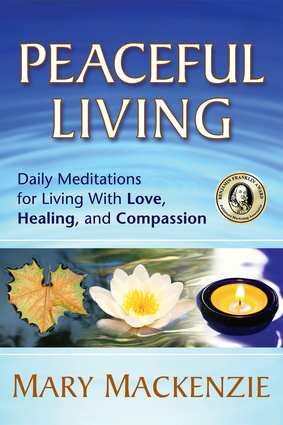 Peaceful Living goes beyond daily affirmations, providing the skills and consciousness you need to transform relationships, heal pain, and discover the life-enriching meaning behind even the most trying situations. Begin each day centered and connected to yourself and your values. Direct the course of your life toward your deepest hopes and needs. Ground yourself in the power of compassionate, conscious living. Mary Mackenzie, MA, is the co-founder of the NVC Academy, an online school for learning Nonviolent Communication; executive director of Peace Workshop, International, a nonprofit organization dedicated to supporting practical methods for living nonviolently; certified trainer of Nonviolent Communication for the Center for Nonviolent Communication and mediator. Mary brings extensive experience in creating and maintaining collaborative organizations and partnerships in the business world and within families, in finding a way forward that values all needs even in challenging decision making processes, and in balancing efficiency and authenticity in all interactions. She is a deeply spiritual person with a keen sense of humor, inner clarity, and insight. Mary's guiding vision is to help people learn concrete, practical tools for living peacefully day-to-day. She believes that if each of us steps up to the plate to transform our own negative behaviors and thought patterns we can create world peace, one heart at a time. Her individual coaching sessions with people who want to fully integrate Nonviolent Communication into their daily lives, workshops, retreats, organizational development, group facilitation, public speaking engagements, and personal daily life reflect this passion. Mary lives in Long Beach, California, with her wife, Kimberly Fox.